The science is clear! End of conversation! Are you an enemy of the state? I thought he was supposed to be a ‘lukewarmer’? Zeke? No he’s always been front and centre in the AGW scam. “The government had assumed 11,000 electric cars would be bought in 2018, with an average price of €43,000. Instead, 25,000 were bought for an average of €63,000 each. This, the paper says, means the subsidy scheme has overrun its budget by ‘a couple of hundred million euros’. And in a lot of Dutch cities poor people no longer can go by car because their car is too old. So older cars have been made worthless. Only the rich can go there now with their government funded car. That’s how progressives care about the poor. No car no cake. For hundreds of millions of years humans were 0% responsible for global warming-espacially in the last 3-5mio years since they are supposed to exist. But everything changed in the last 3 decades when the global warming arrived scientists of the 70ies have been praying for to save us from the coming ice age . That so much desired warming turned by some very strange coiincidence the same day into something evil as co2 did. Using snow and ice covered cars as prove for global warming?! Somewhere an asylum is missing someone. Note the typical trick of using a pic in extremely cold weather that shows a visible plume from the car exhausts. A plume of water vapor. Same thing we see for power plant pictures that they use. Wait for the coldest day of the year and take a picture that you can use, implying that the stacks are pouring out smoke. The trick is not to actually claim that, but let the image speak for itself. Don’t underestimate the environmental impact of Fred Flintstone’s SUV! They can’t even explain the 1910 – 1945 warming, which their analysis says could not be human caused. This is the ULTIMATE climate change story…Now the Earth IS literally burning up due to global warming…at -30C. It looks apocalyptic, but in the entirely opposite direction of what EXPERTS predicted…Chicago was supposed to have a climate like Arkansas…RIGHT??? 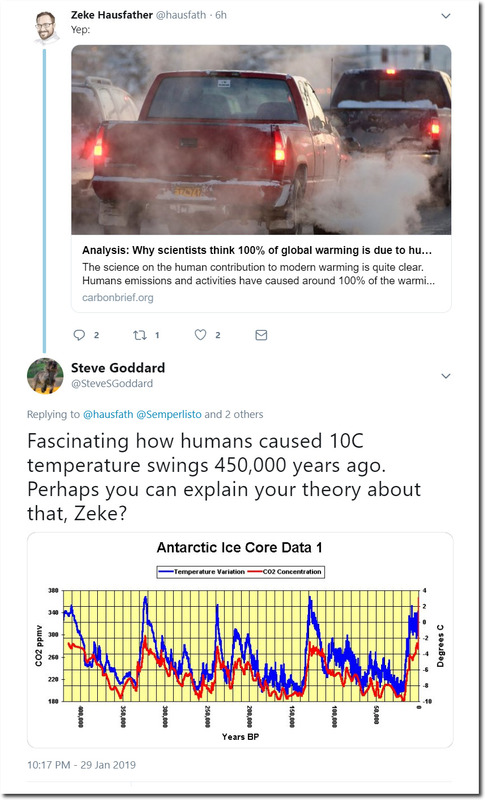 You could validly erase the ‘h’ in all too many cases – including that of Zeke H.
It was someone’s assertion (many years ago) that “100% of warming is due to humans” that caused my first doubts about the alarmist warmist narrative. It was, and is, so utterly stupid, ignorant and unscientific. Does anyone from NASA/NOAA explain what happens to the two lots of Latent Heat when water vapour from the oceans falls as snow in Chicago? Off topic perhaps but I have been following intellicast for historical temperature records for years, but now that they merged with weather underground, this information is no longer available (?). This was a great site often going back to the 1800’s and covered most cities. I never found many high temp records in the 2000’s. Any alternate sites? I love the bit on the twitter feed where they have the warning at the bottom of Tony’s post that says “may contain sensitive material”. Being a hardy type I clicked “view”. Lo and behold the “sensitive material” is the Antarctic Ice Core Data chart. Not sure if I can take this much sensitivity…. I wonder how many twitter users have the courage to click on the sensitive content view box and reveal the shocking ice core data graph. Do they have their phones ready to call the police and report the chart as a hate crime?